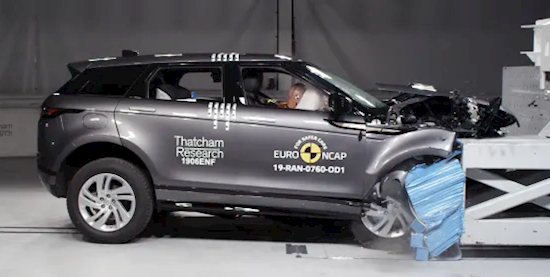 Range Rover’s new Evoque achieved a five-star safety rating in Thatcham Research’s Euro NCAP tests as Citroën's C5 Aircross emerged with four stars. The two SUVs fought it out in different classes and while the new Jaguar Land Rover (JLR) offering achieved top marks – with an Adult Occupant Protection score of 94% - the Citroën's “credible result" suffered slightly due to a lack of standard-fit safety technology. A five-star rating was awarded for C5 Aircross vehicles equipped with the optional safety pack, which includes an enhanced Autonomous Emergency Braking system capable of detecting cyclists and a Citoren spokesman later stated that all UK models come with this pack as standard. Matthew Avery, director of research at Thatcham Research, said: “The new Range Rover Evoque is another sterling Jaguar Land Rover product. Avery added: “It is pleasing to see a carmaker maintaining such a consistent five-star safety record, working with Euro NCAP to protect occupants and vulnerable road users. In some markets the C5 Aircross comes with a camera-only Autonomous Emergency Braking (AEB) system, which can detect and respond to pedestrians. The camera and radar system included with the optional safety pack can detect cyclists as well as pedestrians. “The Citroën C5 Aircross’s four-star rating is a credible result in the small SUV crossover category. However, it is disappointing that the AEB cyclist system is not fitted as standard," said Avery. “Citroën drivers are having to pay extra to detect cyclists when other vehicles of similar cost, such as the Ford Focus and Mercedes A-Class, already offer it in their overall price. “Consumer take up of optional safety packs is very low, below 5%, so it is vital that carmakers fit this safety equipment as standard to protect occupants and vulnerable road users.